Sleeping Beauty delivers high drama, tender romance, spectacular dancing and glorious Tchaikovsky music. The stage is filled with familiar characters like Princess Aurora, the Handsome Prince, the King and Queen and their splendid Royal Court, as well as characters from the fairy realm, including the Lilac Fairy, the wicked Carabosse, Puss in Boots, Red Riding Hood, the Blue Bird and the Enchanted Princess. One Park, the upscale condominium in Cliffside Park, has quickly made its mark on the New Jersey Gold Coast housing scene. The 14-story building is the first large scale luxury building to open in this Bergen County borough in a generation and its sales success is validation of Cliffside Park’s ascension into a preferred residential destination for buyers from both sides of the Hudson River. It’s also indicative of a larger trend that’s building steam in today’s real estate market. While the growing popularity of City living in places such as Ft. Lee and Jersey City in New Jersey, and Long Island City in New York City is certainly well documented, there’s also a significant segment of buying public heading in the opposite direction and choosing to reside in inner ring municipalities that provide both a slice of an urban lifestyle and the high quality of life of the suburbs. On New Jersey’s Gold Coast this shift can be seen by the many bypassing the expensive “City-centric” lifestyle in Hudson County and moving to hidden Bergen County residential treasures that still provide access to vibrant downtown centers, shopping and lifestyle services and a commuter-friendly location a short trip from Manhattan’s work centers, but offer a more relaxed, quiet hometown environment. Such is the case in Cliffside Park which is located high atop The New Jersey Palisades Cliffs overlooking the vibrant Hudson Riverfront district below and a short trip to Manhattan. Conveniently situated between the George Washington Bridge and the Lincoln Tunnel, and just minutes from NY Waterway ferry service into New York City in Edgewater and Weehawken, Cliffside Park has seen a surge in many families and young couples moving to the area. This influx of new residents in the Borough has been further amplified by a large number of professionals relocating and establishing roots for employment at major companies such as LG, which is building a brand new 27-acre headquarter in nearby Englewood Cliffs, as well as the upcoming American Dream, an entertainment, recreation and shopping mega-center expected to open this spring in East Rutherford. 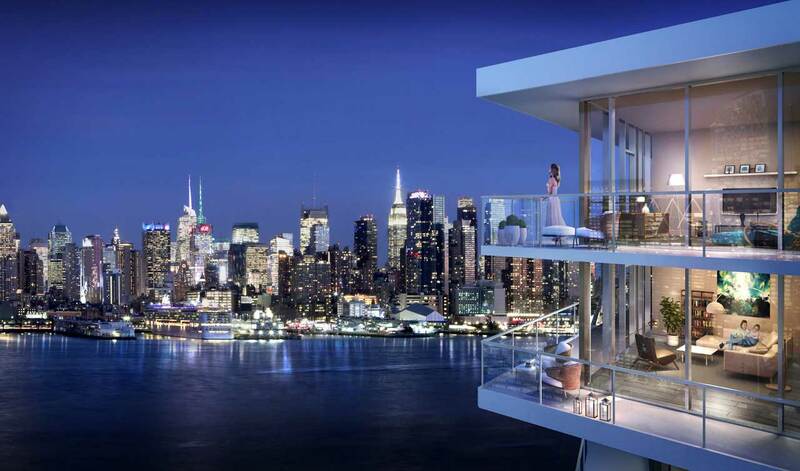 This has unquestionably cemented Cliffside Park as the leader of the next generation of desired residential addresses near New Jersey’s Hudson River waterfront. The advancement of Cliffside Park into a fashionable “Gold Coast” neighborhood can initially be seen along Anderson Avenue – affectionately referred to as “The Avenue” – as it stretches along the borough’s eastern border. With updated and modern storefronts, Anderson Avenue is adding a new wave retailers and eateries to existing establishments to serve a growing clientele which includes everything from Italian to Turkish. The result is an appealing suburban/urban environment and “City-centric” ambiance. An eclectic offering of dining, shopping and waterfront recreational and nightlife pursuits are also just minutes away along famed River Road and in Edgewater, Weehawken, North Bergen and Hoboken. With its popularity growing, Cliffside Park is currently experiencing a bit of a development surge, with new residential projects that provide an upscale living environment that rivals counterparts in Hoboken, Jersey City Manhattan and Long Island City. The rush is being led by One Park which has been developed by DMG Investments on the edge of the Palisades Cliffs with uninterrupted views of the Manhattan skyline. The first buyers started moving into the building in October, 2018. One Park features 204 luxury condominium homes. Designed by Architectura, with interior spaces curated by VLDG, One Park features a glass window wall facade that incorporates elements of the building’s unique location and amplifies a sense of privacy and security. The stunning building features a mix of one- to four-bedroom homes ranging from 752 to 2,983 square-feet. The condominiums are fully customizable with interior features and selections that create a luxury living environment perfectly tailored to each buyer’s personal lifestyle. Each residence has private outdoor space. The homes are priced from the $500,000s and available for immediate occupancy. Residences at One Park are equipped with opulent and comfortable finishes. Bedroom suites are calm sanctuaries for rest and relaxation, with floor-to-ceiling windows flooding the space with light. Spa-inspired master bathrooms are adorned with a freestanding sculpted tub, large open shower, porcelain flooring and richly-toned wall tiles. Many homes boast majestic views of New York City and the Hudson River. The dramatic elegance and sophistication of One Park are further enhanced by its more than 25,000 square feet of hotel-like indoor and outdoor amenities. These will include a 24-hour attended front desk, an Aquatic Center featuring an indoor 55-foot heated pool with sauna and steam rooms and adjoining outdoor sun deck; private furnished roof deck including dining terrace with grilling stations, fire pits, intimate seating areas and outdoor movie theater. There’s also a state-of-the-art fitness center with private Pilates room, squash court, golf simulator, children’s playroom, pet spa, guest suites and a secure parking garage with a fully-automated Unitronics system. Also expected is a resident’s-only shuttle bus directly into midtown Manhattan. Three model homes are open at One Park, providing visitors the opportunity to see first-hand its elegant and sophisticated housing styles. For additional information on One Park, and to tour the building and models, please call 201-633-7600 or visit www.OneParkCondosNJ.com. One Park is located at 320 Adolphus Avenue. Improve balance and stretching, tone muscle and develop your strength, challenge yourself to feel better and live better. Space is limited so make sure you come early or call ahead of time to secure your spot. Urban Souls, a new wellness studio designed to help busy urban dwellers unplug and recharge through a variety of innovative yoga, meditation and sound experiences, will open its doors to the public on April 15th, 2019. Located on the fourth floor of 100 Hudson Street in downtown Hoboken, Urban Souls will offer a full schedule of classes taught by seasoned instructors, some with strong local followings. Featuring a welcoming and airy setting with eco-friendly cork floors and expansive arch windows that bathe the space in natural light, the studio will serve as a peaceful escape from the bustling city and everyday stresses that can take a toll on minds and bodies. Urban Souls is the brainchild of longtime Hoboken resident and Life Coach Karen Flannery and experienced Yoga and meditation teacher Brendan Gibbons. The partners recognized a need for a tranquil space for both practiced yogis and beginners alike. Their inspiration for the studio stems from a desire to create a supportive, inclusive environment that promotes healthy connectivity on a deeper, more meaningful level. Flannery notes that even though we are constantly connected through our smartphones, computers and social media, many of us feel disconnected with ourselves and those around us. Urban Souls aims to bridge that gap. Visitors can begin to leave their stresses at the door as soon as they enter Urban Souls’ Open Space, a casual community room where they can enjoy a cup of tea, practice meditation, watch a Ted Talk, or simply take a moment to map out the rest of their day. Urban Souls’ full slate of yoga and meditation classes will take place from morning to evening to accommodate busy schedules and life commitments. In celebration of its Grand Opening, Urban Souls is offering its first week of classes from April 15 to April 21 at no cost. Discounted rates on future classes will also be available until the end of the first week. Rise & Prime – Yoga Kick-start the day with an energizing morning flow that seamlessly integrates breath, yoga, and inspiring music in a refreshing 60-minute session. Rise & Prime 3.0 – Meditation An inspiring 30-minute breathwork and meditation session, for newbies and experienced practitioners alike, balancing breathwork, progressive body scans, silent mantra meditation, and guided mindfulness journeys. Slow Groove – Yoga By linking full, unhurried breath with slow, steady, gentle movements, and holding postures for several breaths, we’re challenged to play with our edge while exploring alignment details and modifications at a comfortable pace. Slow Groove 3.0 – Meditation A breathwork and meditation session designed to calm the body, bring mindful curiosity and openness to the present moment, and set you on a steady course as you navigate the rest of the day. Unplug’d – Yoga A rejuvenating lunch-hour session that realigns the spine, opens cramped hips, and mobilizes stiff joints. Carefully chosen poses will nourish musculoskeletal and increase blood flow to restore “chi”—life force energy. Unplug’d 3.0 – Meditation A 30-minute journey that explores rhythmic breathing, progressive muscle relaxation, and guided meditation. Urban Drift – Yin & Yoga Nidra A combination of Yin Yoga and Yoga Nidra. Urban Warriors – Yoga At once vigorous and cathartic, you’ll groove to an experiential landscape of flow and breath set to DJ-quality playlists. Weekend Wind Down – Yoga + Vino Cheers to health and happiness with a relaxing yoga session followed by a tasty glass of vino. Connective Range Conditioning – Alt Movement Combining the benefits of yoga, movement arts, and science-based training principles to train, strengthen, and nourish the connective tissues in your joints through specific mobility protocols. Urban Oasis – Restorative Yoga Release deeply held tension by “steeping” in passive, supported poses amidst a mellow soundscape. Evening Chill – Yoga Come back to your breath, slow down the frenetic pace of urban living, tune into what your mind-body needs most—then relax deeply with a sweet, restorative finish. Melt® Method – Alt Movement A gently active, restorative technique that helps to relieve aches, pain and stiffness— while bringing your body back into needed balance. Kick It*OM – Alt Movement Combo of high-intensity exercise and measured, gentle movements, Kick It*OM blends calisthenics, kickboxing, and yoga to tone, strengthen, and promote flexibility. YIN – Yin Yoga Targets the mind-body connection just like other styles of yoga, yet with prolonged holding to not only stretch muscles, but to move directly into the connective tissues that hold everything in place. Test your knowledge of local history when the North Bergen History Archive Project hosts a fun and informative night of North Bergen Trivia & Treats. Learn about famous and forgotten incidents, people, and places right here in your own back yard. We’ll also be unveiling many great photos and memorabilia contributed by township residents, revealing our fascinating past. If you have photos or relics to add to the collection, contact the library today to make an appointment for us to scan your items. Come celebrate Easter and Springtime with this time-honored tradition. Meet the Easter Bunny and find a “Golden Egg” redeemable for special gift! Join the fun on Saturday, April 20 at the Fort Lee Recreation Center. Kids 6 and under, 10:00am; Kids 7-10, 10:30am. *For Fort Lee Residents and Families of Borough Employees only. Forget the tolls and traffic and RUN the Lincoln Tunnel. This unique 5K takes runners through the tunnel and back, all to benefit Special Olympics New Jersey. To register, email WeehawkenRecreation@gmail.com for the link to join Weehawken’s Home Team. Special promo for Weehawken residents will be available. Well here is the rain date and this time it is an EASTER Theme and we will be there too. Join the fun down at Fort Lee Dog Park for all the festivities. Photos with the Easter Bunny, Vendors, Food Trucks all kinds of adventures.